Island View House is five bedroom house with free-form swimming pool set above Watamu beach with stunning views out over the Indian Ocean. There is a private access to Watamu Beach below. For the times when you need to retreat from the hot sun there is a TV with satellite television and DVD player. 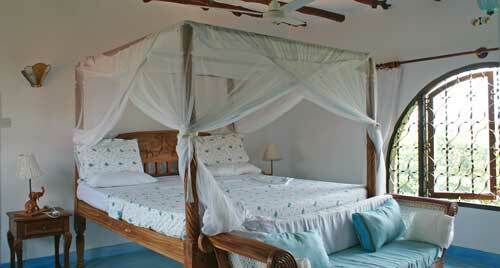 The property has five double bedrooms, each with overhead fans, and mosquito nets. The large free-form swimming pool has a unique feature of a covered dining table in the middle, accessed by a bridge. There are plenty of areas to relax and drink in the spectacular sea views. The house is staffed with a housekeeper and security - a casual cook can be provided for an additional fee if required. MASTER BEDROOM Double Bed Fitted Mosquito net – overhead fan – walk-in closet – large ensuite bathroom. BEDROOM 2 Double Bed Fitted Mosquito net – overhead fan – shares shower room with Room 3.